« Baseball style jacket … with a bit of Fair Isle! The good weather continues and gives a real umph to everyday activities. Wherever did we get the idea that living in a damp and overcast land gave the British a bit of a push in the get up and go stakes? It’s obvious nonsense. The sun even caused me to put down my sewing needle for long enough to plant a zinc tub with bright pink geraniums and a couple of tall terracotta pots with stately, heaven-pointing blue salvias, so we no longer have to relay upon getting our floral kick from the roses and honeysuckle that bob over the fence from the mature garden next door. One lovely day last week while we had one of my husband’s granddaughters staying with us, we took the train over to Bath for another sort of floral kick, A Celebration of Flowers by Kaffe Fassett and Candace Bahouth, an exhibition at The Victoria Art Gallery (on until 2 September). 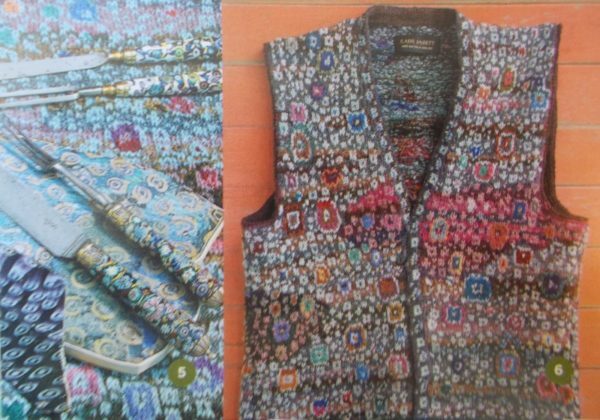 I missed the big Kaffe Fassett exhibition at the V&A of years and years ago and though I know his designs and fabrics well and have his books, I had an itch to have a look a bit more closely at the resulting textiles and wallow in the power of colour. Colour did not disappoint. It was a small exhibition with about a dozen quilts, a selection of Kaffe’s needlepoint cushions, many known from Ehrman kits, and a few larger one-off needlepoint panels. It was good to be able to get up close to the quilts to work out which were done by hand over papers and which were sewn on the machine. Most, possibly all quilting was done by machine – probably sent away to a long arm quilting machine. I don’t like the sharp lines of machine quilting, much preferring the softer look of hand quilting and I felt quietly happy that there remains at least one aspect of hand sewing that machines don’t do as well. I was interested to see that the threads on the large needlepoint hangings didn’t completely cover the canvas and offer no criticism of that when I say that I’m not quite sure I could do the same. Towards the end of the exhibition was a little panel of various sample textiles for us to touch and turn over. They should have placed it earlier as by that time, many people (possibly including me) had flicked over the corner of the odd loose hanging quilt or two, to have a good look at the wrong side! 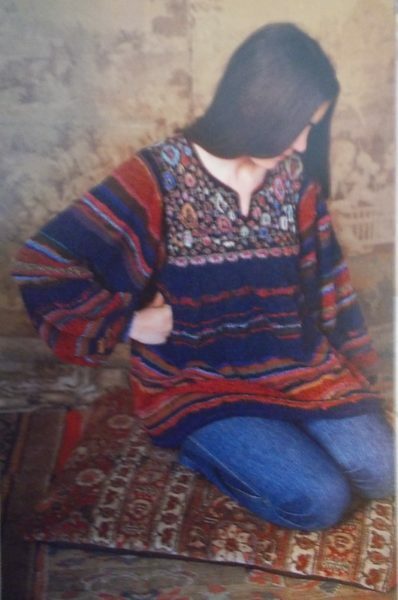 Barbara Streisand had Kaffe reknit this with black instead of blue in the early 1980s. Back home and the bookshelves called. At the moment, I’m going through a glorious phase of digesting my way through books that have too long sat unopened and unread on the shelves. 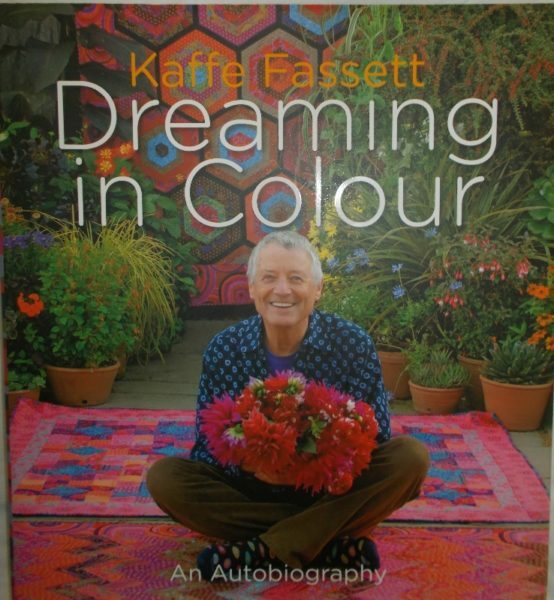 Perhaps it’s because our two recent moves have jumbled up our books so much that strange juxtapositions of titles makes me see them afresh, especially when you spot a book called Dreaming in Colour (Kaffe Fassett’s autobiography, looked through but never read). And it’s a terrific read, novel-like about his bohemian Californian childhood and idiosyncratic education, colourful and warm about his talented family and salivatingly good about his art and craft. On top of that and with serendipity the size of a solar system, almost every sort of interesting person imaginable falls directly in his path and go out of their way to be hugely kind and helpful. As I say, more like a novel than life. Snippets of famous lives fascinate. He tells one of the nicest stories ever told about Princess Margaret who, answering her own doorbell to her flat in Kensington Palace, bustles Kaffe and his friend Jeremy Fry over to her newly acquired harmonium where she bashes out Alexander’s Ragtime Band and sings at full throttle. Antonia Fraser, possessor of a “ravishing complexion” and a splendid antique patchwork quilt is cajoled into lending the latter as a background to Kaffe’s still life painting. Kaffe has creative ideas about everything and many take root, though fruition may be slow. John Schlesinger, on Kaffe’s recommendation tried to read the novel Midnight Cowboy but said he couldn’t get past the second page. Two years later Schlesinger, with filming of the novel under way, sent the then impecunious Kaffe £5,000 finder’s fee (enough later to help towards Kaffe buying a flat). And so on… Underlying all the magnificent serendipity strides Kaffe – decent, generous, modest and forward facing. Incredibly, this year he will be 81. I don’t think I can bear to think of a world without him. Singlehandedly, he rescued millions of British women from producing quilts and cushions symphonic in browns and beige; he made us all a little bolder with colour, even if we may not want to go quite all the way with him. Long live Kaffe. 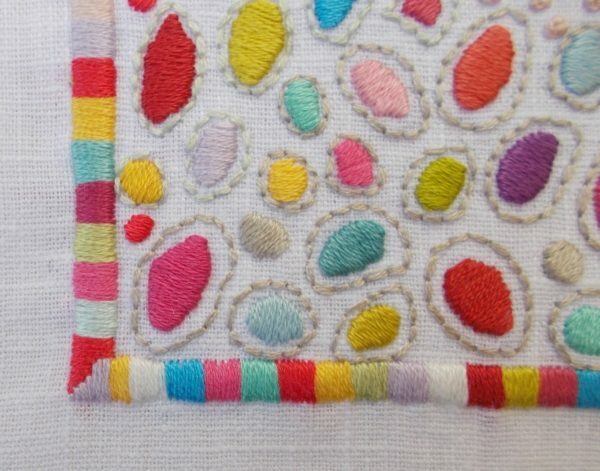 This little embroidery for the daughter of an American friend is inspired by Kaffe’s designs and uses up all those little bits of bright magpie attracting embroidery threads left over from other things. Funny, embroidery is the one type of stitching I don’t think he’s tried. Never say it’s too late. 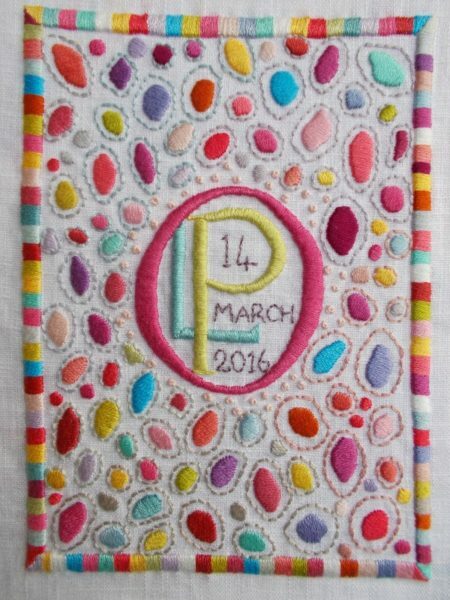 Sunday 23 June: I wasn’t happy with the embroidery as it was and when I received the little girl’s initials and date of birth I redid the central panel as a monogram which makes a much more satisfying image. Go to gallery (on the right near the top of this post) if you want to see what it looked like before I altered it. It’s too easy to play safe with colour and to then find you’ve committed yourself to drabness – I’m sure we’ve all done it! 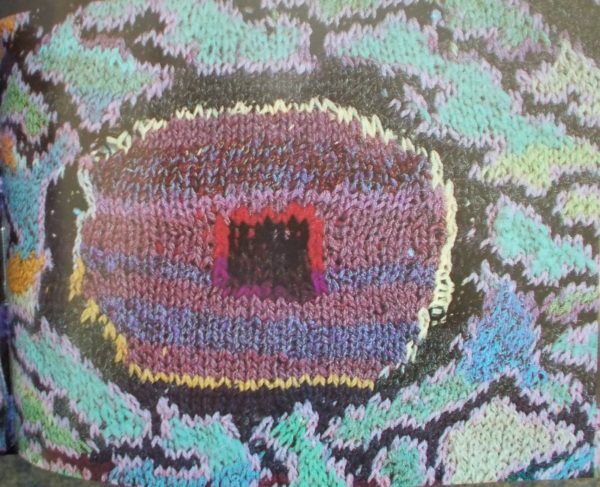 I have been a lover of Kaffe Fassett ever since he first burst on the scene. I went to the V&A exhibition with friend and baby in tow! It was wonderful and we too remarked on the missed stitches in the needlepoint. But then, isn’t it the Persians who say only God makes things perfect. There are imperfections in every carpet made apparently. I have always loved his use of colour and the way he puts the unexpected hues together. His website is certainly worth a look…. Well done for getting to the V&A exhibition, especially with a baby. I look back at amazement at the things I did with small people in tow when one had the urge to go somewhere – up and down escalators and tube station stairs (lifts seemed to be a rareity) with one strapped to my front and the other in a buggy. People were always very helpful, though I never went anywhere that I knew I couldn’t manage alone. I agree wholeheartedly about imperfections, though they seem much more acceptable in Persian rugs and embroidery than knitting where it just looks like you made a mistake or ran out of the right colour wool. Your embroidery is so beautiful. 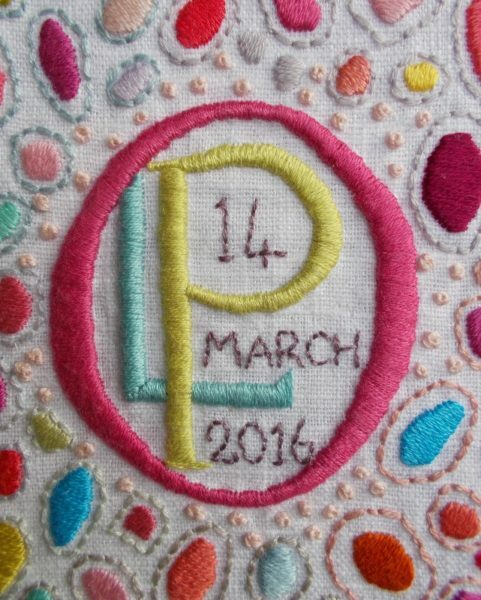 Was the multi color baby initials done with two strands of DMC cotton floss? I have scores of beautiful linen napkins of my mother’s and would like to try something like this for my grandchildren. I have enjoyed your posts for many years. Miss the biscuit recipes, and would love to hear more about the transition to retirement. Thank you for sharing your work. Thank you for letting me know how much you’ve enjoyed my posts. It is always a thrill to hear from readers. I will talk more about our new life in Cheltenham where my husband’s focus has been more with working with the art gallery and museum, rather than the church, while my foci are more disjointed and still evolving (finishing off the altar frontal for Ipsden, visiting London to help out with family there and hoping that Cheltenham’s costume collection can become publicly accessible and thus in need of volunteer help). Have been thinking about biscuit making once more…so thank you for encouraging these thoughts! I am so grateful you introduced me to this man. I had never heard of him before this post. I may have to read that biography. I’m so surprised you haven’t heard of him, Amara. his autobiography is fascinating, especially about his early life in California where his mother and father built a stunning wooden lodge on/in(?) Big Sur and opened a restaurant Nepenthe which became a haunt for California artists and bohenians https://www.nepenthe.com. If I lived in the States, I’d make plans to visit it one day!